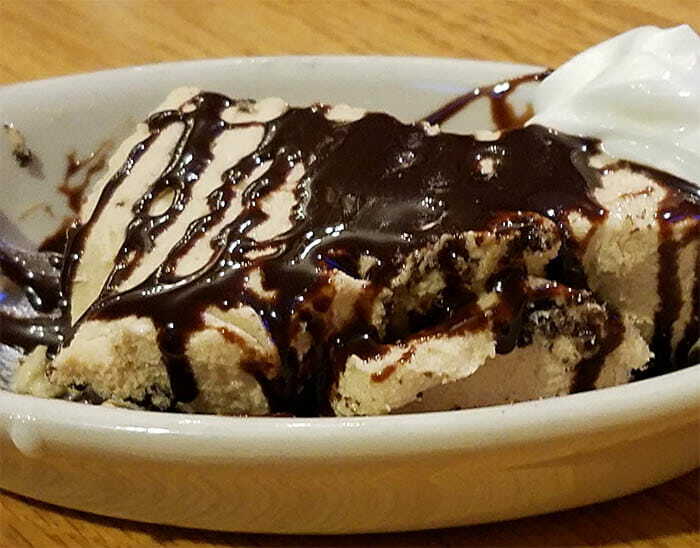 I have eaten at the Cow Palace a number of times over the years, and always find it to be an enjoyable experience. 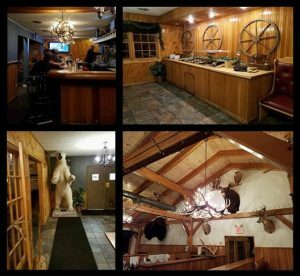 Besides being a comfortable dining room, providing interesting conversation pieces, and having a wonderful outdoor dining area diners get a lot of menu options for all tastes and during the warmer months, can watch the elk outback while dining. The Cow Palace has been at the same location for a number of years – I was unable to find when they opened, but I have been in the area for 20 years and they have been a local staple. Located right in Derby at the intersection of Rte. 5, it is not a location you can miss. Backed by an elk farm, it provides a beautiful setting for a restaurant. The Cow Palace is known for being a steak house. They have plenty of meat options including elk steaks and elk burgers. But there are many other things on the menu. Broiled or fried seafood, pastas, ham and chicken dishes, inventive sandwich combinations, traditional burgers, stir fry options, vegetarian items, and a salad bar. The vegetable sides that come with meals are not super exciting. But this allows for one of my favorite things about the Cow Palace – it’s salad bar. 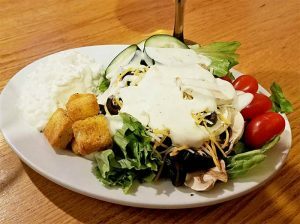 It is one of the very few restaurants that still have a salad bar, making a nice addition for us more health conscious, veggie loving eaters. A starch is also included with most meals, and I do like that this can be baked, twice baked, or mashed. Fries are also an option. On our recent visit, we started with a few cocktails – one a martini and the other a shrimp… I stuck to wine as my drink for the evening. The shrimp cocktail appetizer was a great way to start the meal. The shrimp were sweet, and good size. And the cocktail sauce had a nice bite to it. My husband had his obligatory martini – but I stuck to a glass of wine on this go round. Drinks are large pours and the bartender knows how to mix drinks. Mixology is often lacking at Kingdom restaurants so this is a refreshing discovery. I ordered the Seafood Casserole. 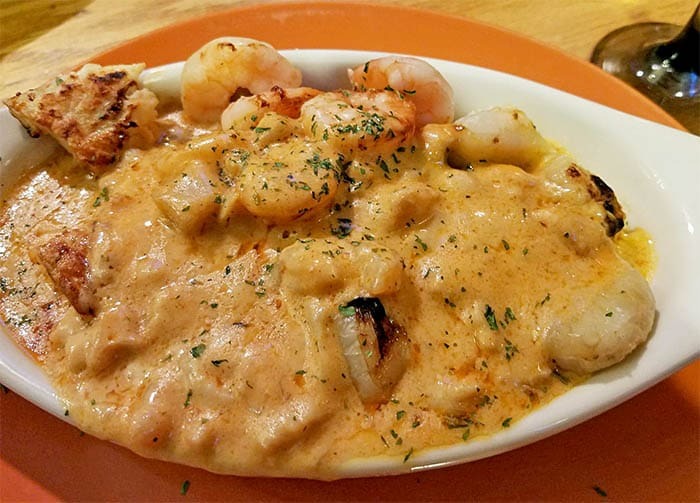 This dish is a collection of baked shrimp, plump scallops, and haddock covered in a Newburg sauce and served on a bed of crab stuffing. I was impressed with the seafood preparation as nothing was over cooked. The sauce was light and sweet allowing the seafood flavor to shine through. But the best part of this dish was the stuffing. I wouldn’t call if crab stuffing as it wasn’t just crab. But, the stuffing had large chunks of crab meat throughout and the stuffing itself was flavorful. The only thing missing from this dish was more garlic. It came with a trip to the salad bar and a potato side. The baked potato I ordered was large and provided more food than I could eat so it, along with the remainder of my seafood, became my next day’s lunch. My husband ordered the smothered Delmonico steak from the menu. This dish is served topped with sautéed onions, peppers, mushrooms and melted cheese. Coming from the kitchen, it smelled wonderful. This nice cut of meat was soft and juicy with flavor added by the vegetables. It too came with a trip to the salad bar and a potato side. One issue we have had with the Cow Palace is having the meat cooked over temp. This has happened more than once to us while visiting. I suggest ordering your dish one temperature lower than you prefer (medium rare instead of medium, rare instead of medium rare). It is easier to ask that the meat be cooked a little longer than to have a dish overcooked. 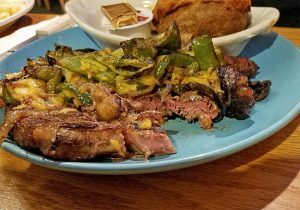 As is common with many area restaurants, the steak itself was fairly plain with most of the seasoning in the sauce or vegetable toppings. I only mention this because some people prefer steak this way, others seem a little surprised by it and prefer their steak to be more heavily seasoned. Now, having been to this restaurant a number of times over the years there are a few other items I want to mention. The poutine is wonderful with salty gravy and melted cheese curd, and a price that is hard to beat. Another item I suggest trying is the Carbonara, thick and full of bacon goodness. I am also a fan of the ribs and elk burgers here. One thing that makes this Derby restaurant a favorite is their prices. Many items are cheaper here than at other local restaurants. All of their steak options are under $25 with many under $20. And with all of the sides, you are almost guaranteed to bring food home.